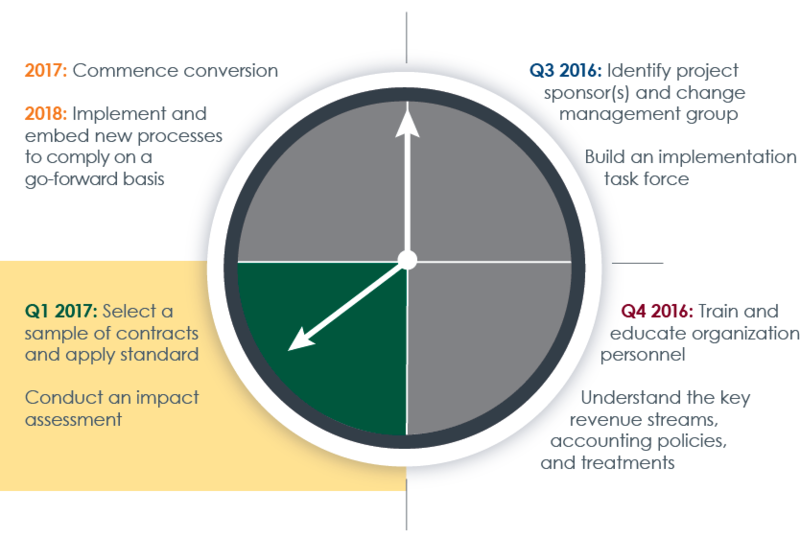 In part 1 and part 2, we provided an overview of the new revenue recognition standard and outlined eight steps to perform at key intervals beginning in Q3 2016. Here, we discuss steps 5 and 6 of the transition timeline, which we recommend performing in late Q4 2016 and into 2017. These activities are focused on selecting a sample of contracts and applying the new standard as well as conducting a comprehensive impact assessment. Once a complete understanding of the types of contracts a company has with its customers is obtained, it is prudent to select a representative sample of such contracts to begin to understand the impact — if any — of the new standard, avoiding general assumptions about the implications. The best way to begin assessing potential gaps is to apply the new standard to a sample of the company’s existing contracts. The key is to look for both similarities and differences between recognition processes under the existing guidance and the new standard. Consider how business processes and systems might need to change as well as the need to update accounting policy documentation. To facilitate this process, the company should perform the “5-Step Analysis” described in the FASB guidance for each of the contracts selected for testing. Below is a summary of the information contained in the guidance. This overview is not meant to be an exhaustive explanation of the five steps; it is therefore recommended that the company carefully understand the performance requirements in the new standard, and seek help where appropriate, especially in areas where significant judgments must be made. 5. It is probable the seller will collect the consideration to which it will be entitled in exchange for the goods or services that will be transferred to the customer. • The seller has no remaining obligations to transfer goods or services to the customer, and all or substantially all of the consideration promised by the customer has been collected and is non-refundable. • The contract is terminated and the consideration received from the customer is non-refundable. • The promised good or service is separately identifiable from other goods or services promised in the contract. Evaluating whether goods or services promised in the contract are distinct has significant impact on when the revenue is recognizable. The standard provides much more guidance on this topic that should be understood fully when applying the accounting. • Top-down approach: A company can work with its sales team to develop a price it believes the market would be willing to pay for a good or service. In doing so, the company should consider its standing within the marketplace. For example, if the company is a market leader it can command a premium price whereas a new market entrant may have to discount its price. • Bottom-up approach: A company can estimate its standalone selling price for a good or service based on a “cost plus” methodology, wherein it estimates its cost to provide a good or service and adds a reasonable margin for its production and selling efforts. At this time, it is important to identify the similarities and differences between the revenue recognition process under both the new and old guidance. As the impacts of the new standard are considered on this representative group of contracts, this is the time that the team should begin to assess the potential implications to the systems, processes, controls, etc. that will need to be changed in order to obtain the relevant data that may not have been previously required. If revenue contracts are primarily focused on a handful of basic agreements that are not significantly modified from customer to customer, the presence of standard provisions will help an organization to manage revenue recognition more efficiently and effectively. However, in cases where there are major differences in each and every contract with a customer, the ability to standardize will be greatly reduced. This step involves looking back at the work done previously when sampling the company’s contracts and projecting the impact on each contract’s revenue recognition forward into the income statement and footnotes. 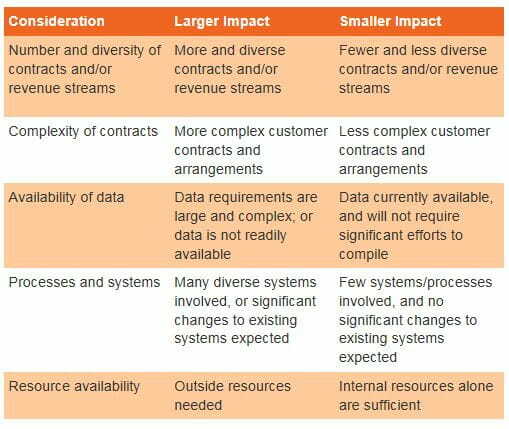 For each accounting and disclosure impact area, the company should identify potential changes and gaps impacting its current reporting structure, data needs and requirements, current policies and procedures, and IT systems supporting the revenue recognition process.Furthermore, the company should assess the overall impact on the control structure of the organization as it relates to recognizing revenue from contracts with its customers. Finally, any potential impact to tax policies and positions, as well as the performance metrics and compensation plans for its sales, operations, and executives should be considered at this time. 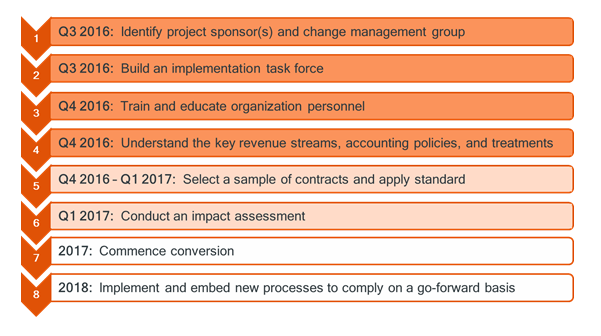 An initial impact assessment enables an organization to determine the required timeline, costs, and resources needed to implement the new standard. Without having completed an assessment, a company may not have enough information to proceed effectively and efficiently with implementation. It is important to note that any company planning to utilize the full retrospective method of adopting the standard will need 2016 information. While many believe that the financial statement impact to their organizations will be small, it is a bad idea to make such an assumption without having completed a formal impact assessment. Some organizations already expect that there may be some level of change as to how they conduct business on a going-forward basis, thus communicating early with stakeholders, investors, lenders, etc. to explain these changes is highly recommended. Systems changes are likely to be pervasive. This is the time for the organization to figure out just how things will look when the new standard is finally implemented. This is also the time to modify any contracts with its customers, particularly those contracts that may have a negative impact on revenue recognition. By 2017, companies should be fully invested in the overall impact assessment such that they are ready to implement in 2018 (if you are a public entity) or 2019 (if you are not). In the final installment of our four-part informational series on the new revenue recognition, we will focus on the home stretch of the transition timeline and discuss commencing the conversion activities companies should perform in 2017 and implementing and embedding new processes to comply with the new standard going forward.